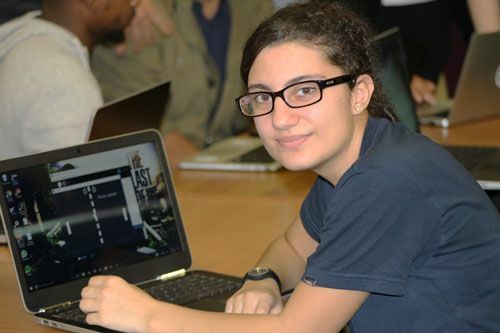 New Computer Science students acquire programming skills to build the foundation for their courses. City University of London's First-Year Computer Science students underwent a rigorous but enriching Coding Bootcamp as part of their Introduction to Programming course. The Bootcamp began on 3rd October and culminated on 13th October with a lively showcase of their interactive and graphical projects. During the showcase, approximately 215 students took over the large civil engineering laboratory space in the Tait Building, transforming it into a digital jamboree of laptops, lights and projectors beaming some of the completed projects off the walls of the lab. Divided into several groups, the students utilised the Java programming language in a Processing programming environment. "The coding background of students at the start of the Bootcamp was varied. It was particularly rewarding to see the community spirit which developed, with the more experienced coders going out of their way to encourage and support the beginners. The progress made by students over the two weeks was remarkable. In this year's showcase we saw an appreciable number of amazingly accomplished and creative projects. Overall, it was a positive and rewarding experience for both tutors and students".